Last month, you may remember that I took a fun little field trip out to the DeLallo Test Kitchens. Jessica and I played around in the kitchen and whipped up some fun dishes, and once we were done, I went back to the store to load up on tons of goodies. Things like fresh-baked rustic bread, prosciutto, provolone, fresh Italian sausage, olives and figs found their way into my cart. The produce section there is to-die-for; it’s unbelievable the variety and quality that they carry for a small grocery. I was elated to find bags of Meyer lemons near the entrance; it’s virtually impossible to locate Meyer lemons at my everyday grocery store, so I snatched them up immediately. I then proceeded to take an embarrassingly long amount of time to decide what I wanted to make with them. Finally, I realized that I was severely lacking a recipe box staple – a lemon loaf cake. This was the perfect recipe for those Meyer lemons! I couldn’t believe how wonderfully light and moist this cake turned out. Even before brushing it with the glaze, the top and sides of the cake were quite soft and almost sponge-like. 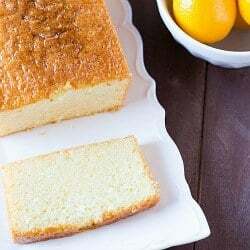 The cake has a buttery crumb and shows off the flavor of the Meyer lemons perfectly. This cake is perfect on its own with a cup of coffee, or topped with some fresh whipped cream and fresh fruit. It’s a fabulous base for dessert experiments! If you’re in the Pittsburgh area, you owe it to yourself to check out the DeLallo store in Jeannette; so much good food, you won’t know what to do with yourself! If you’re not in Pittsburgh, you can order DeLallo products right from their website and have them delivered straight to your door. Happy shopping! 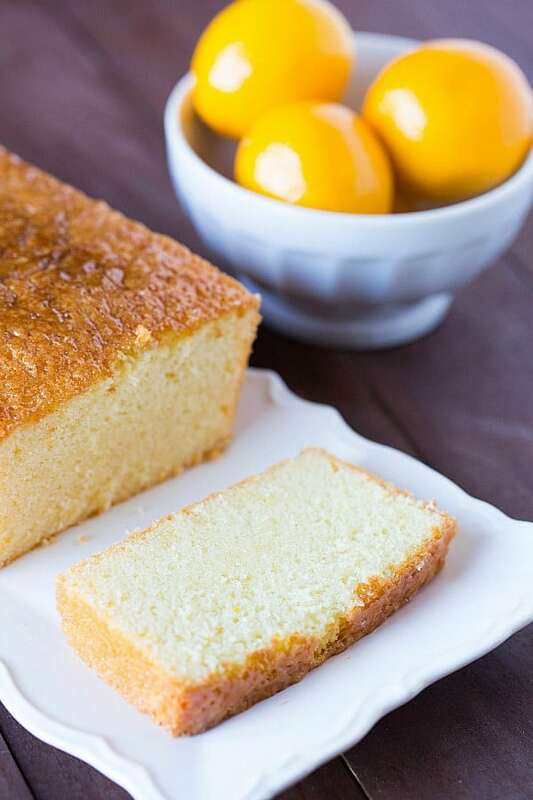 A recipe for a lemon pound cake made with delicious Meyer lemons. Preheat oven to 350 degrees F. Grease and flour a 9x5-inch loaf pan; set aside. Add the sugar and lemon zest to the bowl of a food processor; process until combined, about five 1-second pulses. Add the eggs, lemon juice and vanilla; process until combined, about 5 seconds. With the machine running, add the melted butter through feed tube in a steady stream. Transfer the mixture to large bowl. Sift the flour mixture over eggs in three additions, whisking gently after each addition until just combined. Pour the batter into the prepared pan and bake for 15 minutes. Reduce the oven temperature to 325 degrees F and continue to bake until deep golden brown and a skewer inserted into the center comes out clean, about 35 minutes, rotating the pan halfway through baking time. Cool in pan on a wire rack for 10 minutes. Meanwhile, bring the sugar and lemon juice for the glaze to a boil in a small saucepan, stirring occasionally to dissolve the sugar. Reduce the heat to low and simmer until thickened slightly, about 2 minutes. Remove the cake from the pan and place on a wire cooling rack. Using a toothpick, poke holes all over the top and sides of the cake. 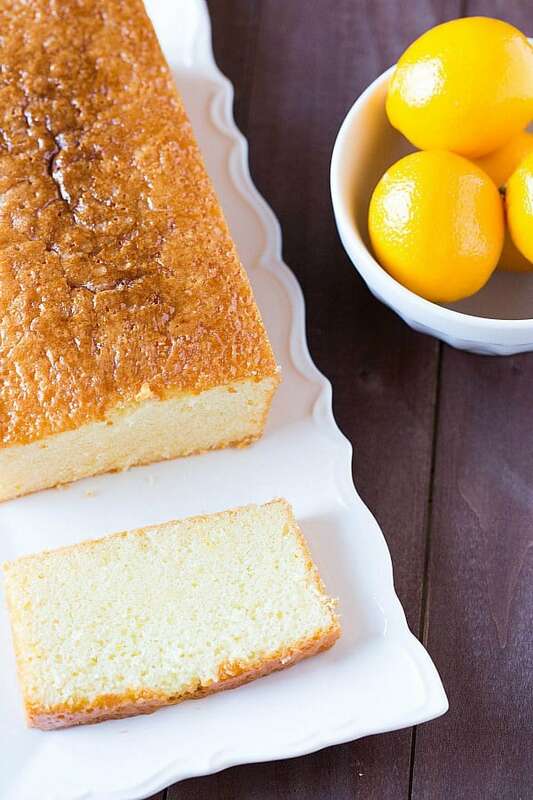 Brush the lemon glaze all over the top and sides of the cake. Allow the cake to cool to room temperature, at least 1 hour. The cake can be stored at room temperature, wrapped tightly in plastic wrap, for up to 5 days.